HTC U11 review | What Hi-Fi? In a market as competitive as smartphones, manufacturers have long been searching for ways to stand out. 4K screens, form-altering aspect ratios, dual-lens cameras – we've seen the lot. But a 'squeezable' phone? That's a new one on us. That's the HTC U11's big selling point, which might sound a little underwhelming. But spend some time with the U11, and you'll find there's much more to this phone than meets the eye. Compared with some other smartphone designs this year, the U11 feels familiar. For a start, it's got bezels - and the 5.5in screen uses the standard 16:9 aspect ratio, so there are no design rulebooks being rewritten here. That's not to say it's lacking in flourishes. HTC has ditched the metal it has embraced since the days of the HTC One and instead uses glass, and a process it calls Liquid Surface. This bakes layers of colour into the glass itself, so it looks different depending on the angle you view it from. It's a chrome finish, so it's a fingerprint nightmare, but when polished looks very nice indeed. There are five colours to choose from – black, white, blue, silver or red. Our sample is silver, but can look ice blue in the right light. HTC has largely stuck to what it knows when it comes to the rest of the design. The home button doubles as a snappy fingerprint scanner; the lock button and volume rocker sit within reaching distance on the right hand side. But it’s the metal frame around the perimeter that holds the key to the U11's squeezy credentials - something HTC calls 'Edge Sense'. It contains touch-sensitive panels built into the lower half of the phone, so it's able to tell when you apply pressure to the sides. You can set how hard you have to squeeze for it to register but, even on the lowest setting, you have to make a definite squeeze motion. It's not something you could activate by mistake. The idea is that you can use it as a shortcut to access certain functions. Out of the box, the default is to launch the camera. Once in the camera, squeeze again to take a photo. It’s a good idea in principle, but we find shots are often out of focus because of the shake that occurs when you squeeze. You can change it so a squeeze gives you quick access to a specific app, or turns on the torch. There's also an advanced mode for adding a secondary shortcut, for a squeeze and hold motion. Is it gimmicky? Absolutely. Useful? Actually, yes it is – we find ourselves using it more than we thought we would. It works from the lock screen so, once you get in the habit, it can save some time. HTC has opened up the functionality for developers to build into third-party apps too, so – a little like Apple's Force Touch – it could be we don't see the true benefit for a while. Our only bugbear is the squeezy section is just a touch too close to the lock button, so sometimes we lock the phone with our thumb mid-squeeze. The U11's 5.5in screen packs a QHD resolution (2560 x 1440), which is par for the course for most Android flagships now. It uses a Super LCD 5 screen, which removes the air gap between the outer glass and display so text is sharper, colours richer and outside visibility vastly improved. Video looks superb. The colour balance is fantastic, nailing skin-tones and putting just the right amount of punch behind brighter colours. Contrast is good enough to challenge AMOLED too – blacks won't go quite as deep, but they come close, and highlights are filled with enough oomph to push through dark scenes with authority. Detail levels are also top-notch, boasting crisp outlines and finely drawn textures. Pictures have a real sense of depth and we don't struggle with any processing or motion niggles. It's not just great for video though – browsing is a breeze thanks to clean, crisp text, and 3D games look stunning too. The U11 might not be particularly groundbreaking with its screen, but it doesn't matter. This is one of the best we've seen from a phone this year. Like Apple, HTC has decided to ditch the headphone jack. It's replaced by a USB-C port (which it also uses for charging). Whether it's the future or not, it's hard to not find it annoying right now. Even if an adapter is included in the box, it's rarely there when you need it. A pair of USB-C in-ears is included, with active noise cancellation. They're better than a lot of bundled buds, but have a tendency to be a little bass-heavy for our tastes, and the noise-cancelling is subtle at best. If you use them, you'll be prompted to set up a sound profile, which is calibrated to your ears. It's a quick process – the U11 fires a test-tone and automatically adjusts the sound based on what it receives back. You can then listen to the before and after, and choose which you prefer. The adjusted sound is cleaner and louder, but sounds processed, and the added bite it gives to the treble verges on harsh. Listen through better headphones using the adapter, and the sound is much improved. It's well balanced and plentifully detailed - but could be more dynamic. As it is, it's a touch laid-back – an easy listen, but not the most engaging. The amp in the adapter struggles to drive less sensitive headphones, and the volume doesn't go as loud as we'd like. HTC uses its front-facing Boomsound speakers to handle headphone-free sound. As usual it's one of the better options out there, sounding clear and going loud enough to watch video at home. It's not hugely detailed though, and could do with a touch more weight. 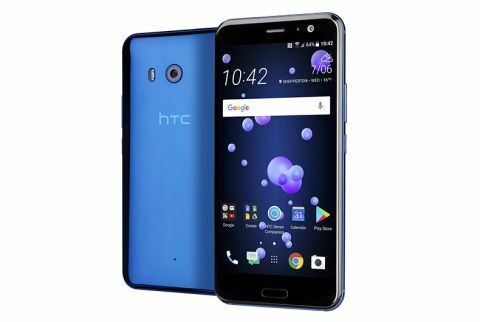 The HTC U11 uses Qualcomm's Snapdragon 835 processor accompanied by 4GB RAM (there's 6GB RAM in the 128GB version) and a microSD to boot. We're testing the 64GB option. It runs smoothly with whatever we throw at it – we don't notice a single delay or hiccup. This is no doubt helped by the fact HTC's Sense UI is pretty light on its feet. You get a few HTC additions, but it largely uses Google's apps as its default instead of unnecessarily doubling up. One place it does double up is voice assistants. Google's own Assistant is ready to help you straight out of the box, but Alexa integration is coming soon too. It'll be the first time Alexa has been fully integrated into a phone – expect it in a firmware update around July. HTC has built a 3000mAh battery into the U11 – not the biggest, but it doesn't do a bad job. It won't give Sony's two-day battery life a run for its money, but it manages to make it through a whole day with some to spare - as long as you aren't doing a significant amount of video streaming. That's where we find it falls down. An hour-long video at half brightness loses 12 per cent. That's not great – we're more used to seeing phones dropping around 8 per cent in the same test. Thankfully, audio streaming proves to be less battery sapping and general browsing doesn't deliver the same hit either. If you are caught short, Qualcomm QuickCharge 3.0 is on board for faster re-charging. HTC's cameras have often been the chink in its smartphone armour, but the U11 finally bucks that trend. The 12MP main camera takes some stunning photos. The dual pixel autofocus ensures quick and accurate focusing, while hybrid image stabilisation helps to keep photos looking sharp. 'Always On' HDR does a really good job at brightening up images too, and deals well with balancing out tricky lighting conditions. In good light, images look vibrant and colours are spot on. The shutter isn't the fastest (and this slows further as light gets lower) but that's negligible when it produces the quality of image that it does. It could easily take on the camera on the Samsung Galaxy S8, which is one of our favourites this year. The f/1.7 lens does a good job in low light too, brightening the image significantly without introducing too much noise. And the 16MP front-facing camera is also pretty talented. Despite the higher pixel count, it's not as detailed (with a touch too much processing for our taste), but it'll take a good enough snap for uploading to Facebook. The HTC U11 is the best phone the company has made in years. It's well built and fast in use, with a great camera and video performance that's among the best we've seen this year. And despite sounding like a gimmick, the squeezable sides are actually quite useful. It's up against some strong competition though, all of which have a stronger tale to tell than the U11's squeezable sides. That might make them more interesting, but it doesn't make them more talented. There's just something effortless in the way the U11 goes about its business, and there are very few missteps. It might not be the most exciting phone of 2017, but it's still one of the best.